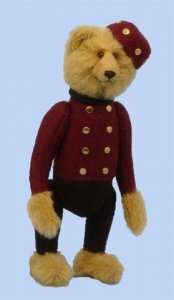 8", 2008, Blond German alpaca head, feet and hands, wool felt bellboy bodysuit in black and burgundy with old toned buttons, with a matching burgundy wool felt hat with gold tone buttons. Stuffed with glass pellets and poly-fill for a soft feel. Glass eyes and fully jointed.